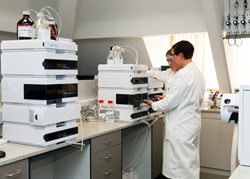 Lucideon, the materials technology company, is hosting a free webinar titled ‘Update on USP Tests for Elemental Impurities – Are you ready?’ on Tuesday 7 June at 3PM (UK time) 10AM (EST). Lucideon is hosting a free webinar titled ‘Update on USP Tests for Elemental Impurities – Are you ready?’ on Tuesday 7 June at 3PM (UK time) 10AM (EST). The Heavy Metals limit test, as defined in USP 231, is being removed after more than a century in use. The chapter will be officially replaced on 1 January 2018 but can be implemented now. This webinar will focus on how the new chapter will affect businesses and the benefits of implementing USP 232 before the mandatory switch at the start of 2018. There will also be attention given to some of the analytical challenges posed by USP 233 - a chapter that defines the methods for analysing the limits given in USP 232. Lucideon provides pharmaceutical testing and analysis through a team of experts and state-of-the-art pharmaceutical laboratories. Lucideon’s experts also provide consultancy to the pharmaceutical industry and have studied the new chapters in great detail to ascertain how the changes will affect businesses and the best way for the transition to be made with minimum disruption. Lucideon’s pharmaceutical services also include: quality control, powder consultancy, failure analysis, method development, cleaning validation, stability storage and testing, including accelerated ageing and microbiology testing. Materials technology developments include inorganic controlled release technology platforms for applications such as drug abuse deterrence.